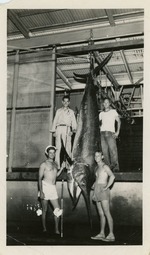 ﻿ Black Marlin caught by "Skip Jack"
Black Marlin caught by "Skip Jack"
3.5 in. x 5.8 in. December 1948. Weight: 776 pounds, Length: 15.5 feet, Time to land: 3.5 hours. Top row: Sam Coleman, brother-in-law of Barney Forgeson; Sam Moody, co-owner of "Skip Jack". Bottom row: Tex Shaler, who caught the marlin rod and line shown in picture; Barney (Bernard) Forgeson co-owner of the "Skip Jack"